As I discussed in part 2  of this series, the Anzacs are high-quality frigates. They will likely age gradually but gracefully over the next 24 years on their journey to eventual retirement. But the issue of quantity might be more problematic than quality. Often you just need presence: a ship at sea in the right location, whether patrolling a sea lane, monitoring a patch of ocean, or just waving a flag. No matter how good its quality is, a ship can’t be in two places at once. The Anzacs have become the backbone of the surface fleet. Every day, Anzacs are at sea. 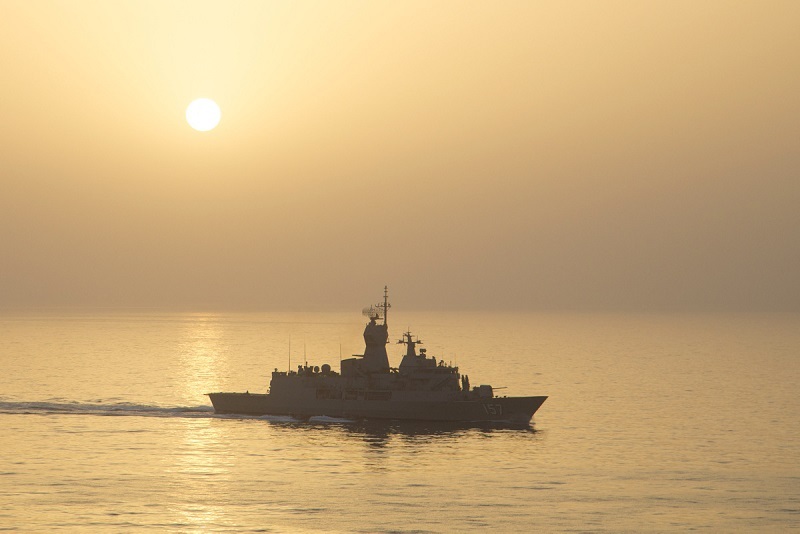 The Royal Australian Navy has conducted continuous rotations  to the Middle East since 1990 and Anzacs have done around half of those since their introduction into service. Every one of the eight ships in the class has deployed there at least once, and HMAS Toowoomba has gone five times. An Anzac is currently on extended deployment with Indo-Pacific Endeavour 2019. Unlike the Collins class, which has very clear public statement of the capability requirement  (page 6)—namely, out of the fleet of six, four submarines in service with the fleet commander (three of which are consistently available for tasking) and two consistently available for deployment—there doesn’t seem to be a public statement of what is required of the Anzac class. Defence’s 2018–19 budget statements  provide a target for ‘unit availability days’ for ‘major combatants’ (page 63), but that includes all frigates, destroyers and submarines, not just Anzacs. So it’s hard to know how the Anzacs are currently performing against the requirements, but the Australia National Audit Office’s recent report  on Anzac sustainment suggests that despite Defence’s best efforts, some of the challenges associated with ageing platforms are already emerging with the ships. Something had to give. The ANAO report reveals that due to lack of a crew, HMAS Perth was put into extended lay-up at the end of its last scheduled maintenance in October 2017 and a crew isn’t expected to be available until sometime between July 2019 and January 2020. Essentially, it’s up on blocks for two years. With two other ships in upgrade , only five of the eight are available. None of these issues are insurmountable. Defence’s approach of rolling all upgrades into the one program (the midlife capability assurance program) is sensible, as is its approach of establishing a long-term sustainment partnership  with industry known as the WAMA. Defence is now well versed in managing ageing vessels along the bathtub curve of increasing cost. Getting a larger, well-skilled uniformed workforce will likely remain a challenge. There will be a long overlap—14 years—between the old and new frigate classes. That’s not quite as long as Collins , but it’s still a period during which competition for resources—in particular, people—will need to be managed. The silver lining in the transition will be the extensive commonality between the two, which will help create a flexible workforce pool.